As much as I love Burlap & Bean in Newtown Square for freshly roasted coffee beans, sometimes my travels just don’t take me that way. Shopping at Wegman’s in Malvern, however, has recently turned me on to a supermarket roast that can compete with the local artisans. How is that possible, you ask? 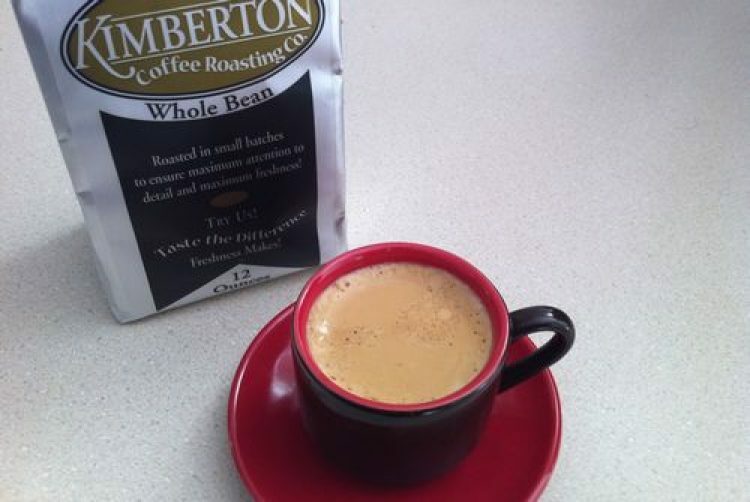 Because it IS a local artisan – Kimberton Coffee, brewed right up the road in Northern Chester County. Freshly brewed coffee beans begin to lose their aroma and flavor in about 30 days (for whole beans – pre-ground begins to deteriorate immediately) and supermarket coffee may sit around for months before you ultimately buy it. Peet’s Coffee differentiates itself in the supermarket by promising that it was brewed within 90 days. 90 days! That’s not fresh at all — not for coffee. I’ve been able to find a bag of Kimberton Coffee, however, that is less than a week old in Wegman’s, ensuring a much more robust and interesting flavor than others sitting in the same aisle. I’ve also seen bags that are up to six weeks old – still better than 90 days – but with the brewed-on date on the bottom of each bag, you’ll know exactly what you are getting before you buy. Does Starbucks do that? There are several blends available, two of which are named after the Phoenixville restaurants where they are served (Kimberton is just outside Phoenixville). The Majolica blend is our favorite – it is clean and robust with notes of chocolate, without any burnt flavor. The Black Lab Blend is a bit darker; those who like Italian or French Roast would be wise to try this one. Seasonally, be sure to try the Harvest Roast, a fall/winter seasonal that’s bold and hearty. Kimberton Coffee is also available online, where it’ll be brewed, immediately put into a high quality, “high-barrier” bag, and shipped out within a day or two. In addition to Wegman’s, it is available at some area Giant and Whole Foods stores (see a list on their website). Just as an FYI: Burlap and Bean coffee is available at all local Whole Foods markets. If you happen to be anywhere near Devon or Plymouth Meeting, you can always pick up some Burlap in their coffee/chocolate aisle. On another note, The Gryphon Cafe in Wayne has started roasting their own coffee with an infa-red roaster. The results are mouth-wateringly decadent, whether you like mind or dark. Both companies are independently owned, and well worth a try!